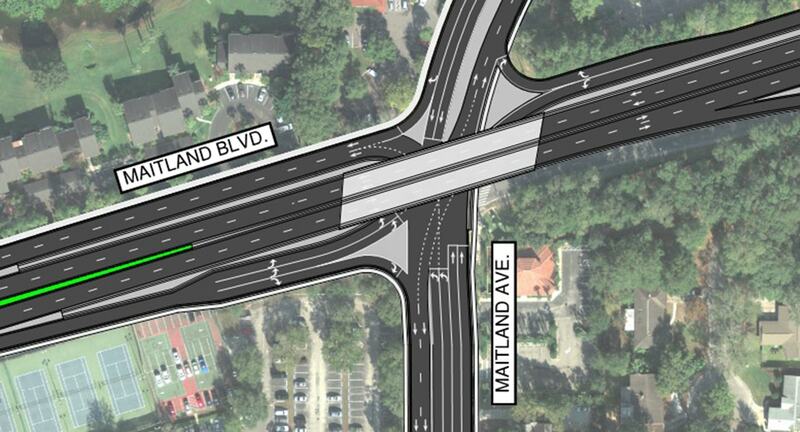 B&N was retained by the City of Maitland to conduct a feasibility study to evaluate grade separating the existing at-grade Maitland Boulevard/Maitland Avenue intersection. This task work order was conducted under B&N’s continuing engineering services contract held with the City of Maitland since 2009. Phase I of the study determined the feasibility of grade separating the intersection and identified potential geometric alternatives for the grade separation. Analyses included Synchro modeling and client work sessions to obtain concurrence with the project’s scope, intent and ultimate deliverables. At the completion of Phase I, a second phase of the study was authorized by the City to further evaluate the geometric alternatives, select a recommended alternative and engage strategic partners such as MetroPlan Orlando and the Florida Department of Transportation (FDOT) in discussions about the potential construction of the recommended alternative. B&N presented at two City Council workshops to discuss advantages and disadvantages related to the grade separated interchange options. B&N met with FDOT District 5 to discuss the project feasibility and potential funding options. The team also worked with MetroPlan Orlando staff to obtain traffic forecasting information and develop long-range transportation models reflecting the proposed improvements.